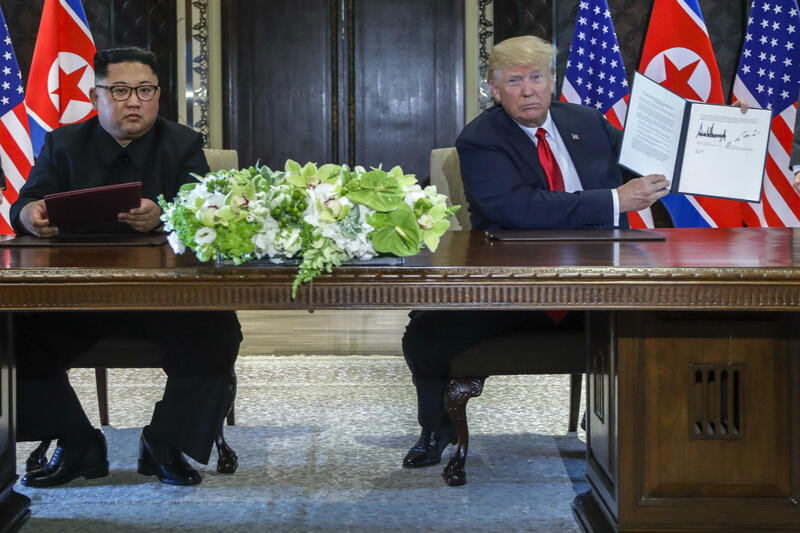 Top former intel official says Singapore summit was "serious misstep"
The Trump administration committed a "serious misstep" in arranging the Singapore summit with North Korean leader Kim Jong-un, according to top former Treasury official and former CIA deputy director David Cohen. Kim's face-to-face meeting with President Trump – and the president's subsequent declarations about North Korea's nuclear threat – may have diminished the world's resolve to enforce sanctions against Kim's regime, Cohen said. "We had President Trump, I think quite prematurely, jump into this summit with Kim Jong-un," Cohen explained, "and then on the way out of Singapore, declare that the problem has been solved." "The effect of that was to weaken the resolve of the international community to apply pressure on North Korea," he said. On June 13, barely a day after his meeting with Kim, the president tweeted, "Just landed - a long trip, but everybody can now feel much safer than the day I took office." "There is no longer a Nuclear Threat from North Korea," Mr. Trump wrote. The leaders' meeting resulted in a joint statement on disarmament but did not include a timetable or specifics on what steps North Korea was expected to take. To date, North Korea has voluntarily ended its missile tests, shut down an underground nuclear test site and returned the remains of some American soldiers killed in the Korean War – but it has made little perceptible progress on denuclearization, a core tenet of U.S. policy toward the North. The nebulous outcome, Cohen said, "weakened the willingness of the Chinese to continue to work with us." "And I think the effect has been that the sanctions are not nearly as powerful today as they were nine months ago," he said. Cohen, who from 2011 to 2015 was Under Secretary for Terrorism and Financial Intelligence at the U.S. Treasury, and until 2017 served as the CIA's No. 2 official, told "Intelligence Matters" host and CBS News senior national security contributor Michael Morell that targeted financial sanctions – generally considered more persuasive than diplomatic solutions and less drastic than military ones – have become a "go-to tool" in U.S. foreign and national security policy. There are currently 29 sanctions programs, nearly every one of which stems from a presidential order. A substantial part of the efficacy of a given sanctions regime, Cohen said, is derived from secondary sanctions – those which take aim at third parties that do business with a primary sanctions target. He told Morell sanctions are "enormously" more effective if other countries "amplify" U.S. policy by instructing their own financial institutions to abide by it. The the key to maintaining pressure on North Korea in particular, Cohen explained, lay in also threatening secondary sanctions against China, which accounts for 90% of North Korea's trade volume. "[E]arly on, the Trump administration embraced that, and applied those sanctions, and did a bunch of work to ensure that those sanctions were being adhered to," Cohen said. The president's overtures toward Kim – alongside increasing trade tensions with China – appear to have led to lax enforcement of existing U.N. sanctions by Beijing. The U.S. has also accused Russia of actively working to subvert international sanctions. After Singapore, Cohen said, "I think that the diplomatic underpinnings of a good sanctions program will be harder to stitch back together." Mr. Trump is expected to hold a second summit with Kim early next year. The amplification effect of secondary sanctions is likely to come into particular focus again next week, as the United States prepares to re-impose unilateral sanctions on Iran's energy sector. While the original sanctions were relaxed under the Obama-era nuclear deal struck in 2015, they are slated to resume after the United States' withdrawal, in May, from the agreement. Iran has indicated it will continue to abide by the terms of the deal. The European Union, Russia and China have announced their intention to establish an ancillary payment mechanism designed to maintain trade relationships with Tehran while sidestepping U.S. sanctions. India, one of Iran's most significant trade partners, has also indicated it will continue to import Iranian oil via an alternative payment system. As a result, the United States' sanctions "will be effective, but they will be not as effective, I think, as the sanctions were in the 2014-2015 timeframe, because you don't have agreement around the world in the effort," Cohen said. "What you've got in Europe, essentially, is a coalition of the unwilling." China and Russia in particular, Cohen said, are "looking for ways to frustrate U.S. policy," and are likely to look for ways to avoid and evade U.S. policy. That combination of economic and diplomatic support for Tehran, Cohen said, could sustain an apparent strategy by its leaders to "wait out" the Trump administration. "One of the things that was, I think, quite powerful in the lead-up to the Iran deal was that Iran was isolated, not just economically but diplomatically," Cohen said. "Today, that diplomatic isolation is frankly ours, not theirs." Overall, Iran's willingness to engage with the current American administration remains very much in doubt, Cohen argued, in part because the United States' ultimate policy goal is less than clear. "Iran's trying to figure out what it is that the U.S. is trying to accomplish," he said. "What is the U.S. policy goal here?" "Sanctions are not a policy unto themselves. They work best if you have diplomatic efforts. You have aid efforts. You have messaging efforts. You may even have military posturing," Cohen said. "If it's part of a broader effort, sanctions can work." For much more from Michael Morell's conversation with David Cohen, you can listen to the new episode and subscribe to Intelligence Matters here.